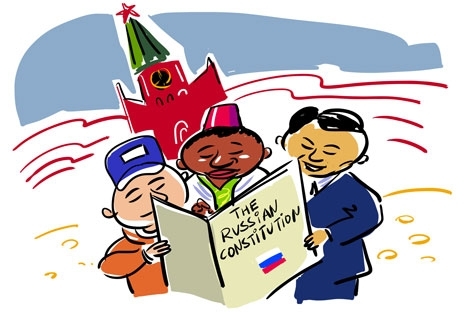 While Russia celebrates the Russian Constitution Day on Dec. 12, Aleksander Bryantsev, legal expert Alexander Bryantsev explains the ins and outs of the Russian Constitution for foreigners. Drawing by Alexei Yorsh. Click to enlarge the image. The Constitution of the Russian Federation guarantees equal rights for both the citizens of foreign countries and the citizens of Russia. However, it also contains an important provision that the equality of these rights applies everywhere, except where otherwise defined by federal law. In regard to Russia’s federal laws, quite a number of restrictions can be found that limit the rights of foreign citizens in Russia. Does Russia’s investment legislature work well? For instance, foreign citizens have no right to elect candidates to office in either federal or local government, and they cannot nominate candidates to run in elections or participate in political parties. Additionally, foreign citizens cannot vote on nationwide ballots – federal or regional referenda. These restrictions do not, however, apply to one specific category of foreign citizen: those granted residence permits and living permanently in the Russian Federation. Thus, a residence permit and full-time residence in Russia will put a foreigner on equal footing with Russian nationals, as far as voting rights are concerned. Russia is not the only country that restricts the rights of foreigners to participate in political life in such a manner. The laws of Great Britain, Germany, Belgium and some other European states contain similar provisions. In the case of Russia, the restrictions are justified as a measure toward maintaining sovereignty, integrity and independence. Restrictions on voting rights are not the only limitations for foreigners in Russia, though. Foreigners are also prohibited from setting up media with coverage reaching more than half the population of Russia. Even so, the restriction does not prevent Russians from obtaining information from foreign media that is broadcasted from abroad, posted on the Internet, or otherwise obtained through public information sources. In addition, certain restrictions on foreigners exist in agriculture, which can be traced directly to the government's efforts to support national agriculture and domestic agricultural producers. Foreigners are only entitled to hold agricultural land plots on lease, and they cannot own land plots in certain areas along the national borders (these territories are expressly listed in the national law). Furthermore, a number of labor-related restrictions apply to the rights of foreign citizens. When hiring a foreign national, employers have to go through a number of additional administrative procedures in order to register a foreigner legally. The employer must, for example, obtain a work permit for the future foreign employee in the manner prescribed by law and subject to prior approval by immigration services. Once the work permit is granted, the foreign employee will only have the right to work in the region of Russia that issued the permit and in the precise position specified therein. On business trips, the period of time foreigners can spend outside of the region that issued their permit is limited. There is also a legally approved list of sites and facilities that require special authorization for foreigners to be admitted – mostly military or scientific facilities essential to the country's sovereignty and defensive capabilities. On the other hand, foreigners have the right to found commercial organizations in Russia and register as individual entrepreneurs, provided they have a temporary or permanent residence permit. This provision permits foreigners to do business in Russia on par with Russian nationals. Ultimately, it is clear that Russia, just as other countries, observes the equality of rights for all people within its borders, irrespective of citizenship. Russia does, however, reserve the option of restricting the rights of foreign citizens whenever it might be necessary to protect national sovereignty. Aleksander Bryantsev is a lawyer from the Moscow-based law firm Levine Bridge.